As part of the Susan and Henry Samueli College of Health Sciences, the Sue & Bill Gross School of Nursing at the University of California, Irvine offers undergraduate and graduate students academic and professional education that will help them fill critical clinical and teaching roles after they graduate. The highly selective school – which offers fully accredited bachelor’s, master’s and doctoral degrees – was chosen by NurseJournal.org as one of the top 10 programs in the western United States for quality, value and satisfaction, and its nurse practitioner faculty is consistently ranked within the country’s top 25. In January 2016, UCI received a $40 million gift from the William & Sue Gross Family Foundation to establish a school of nursing, which was formally approved by the University of California Regents in January 2017. The new school will allow for increases in enrollment and faculty, a need that couldn’t be greater. According to recent reports from the U.S. Bureau of Labor Statistics, the nation will need more than 1 million new registered nurses by 2022. 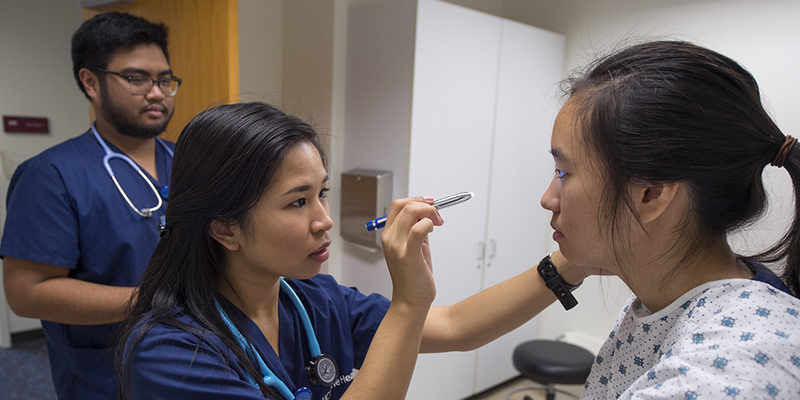 And an increase in nurse practitioners – the UCI program currently offers a robust master’s program in the field – will be required to cover the looming shortage of primary care physicians. Nursing is interdisciplinary and collaborative by nature. It includes application of knowledge from the biological, social, behavioral and biomedical sciences. The nursing school prepares graduates for basic and advanced clinical practice roles, as well as for educational, administrative and research positions across the healthcare delivery system. Dean Adeline "Adey" Nyamathi, Ph.D.
Adeline “Adey” Nyamathi is the founding dean of the Sue & Bill Gross School of Nursing and professor of nursing science at UCI. An adult nurse practitioner and a fellow of the American Academy of Nursing, she joined UCI in January 2017. As a distinguished professor and the associate dean for research and international scholarship in the UCLA School of Nursing, Nyamathi led teams of multidisciplinary principal investigators on more than a dozen NIH-funded R01s and other research mechanisms related to HIV/AIDS, tuberculosis and hepatitis. Her domestic research has centered on the Skid Row area of Los Angeles, among homeless and previously incarcerated populations. Internationally, she has worked with women living with AIDS in rural India. A renowned scholar and academician, Nyamathi has disseminated more than 200 peer-reviewed publications nationally and worldwide, in leading interdisciplinary journals. She earned a master’s degree in nursing and her adult nurse practitioner certification at the State University of New York at Stony Brook and her doctorate in nursing at Case Western Reserve University’s Frances Payne Bolton School of Nursing. The philosophy of the Sue & Bill Gross School of Nursing is aligned with the academic goals expressed by UCI and emanates from the mission and goals of both UCI and the University of California. Nursing is interdisciplinary and collaborative in its art and its science. Together with other health professionals, the professional nurse addresses health care needs of individuals, families, and groups from diverse backgrounds. Health care needs range across the health-illness continuum from health promotion and wellness to intervention, treatment, rehabilitation, restoration, and palliation in response to illness. Professional nursing practice can occur in any environment and includes clinical practice, research, education, and leadership roles. Nursing practice is guided by a set of ethical principles that include a commitment to service and quality health care for all without regard to culture, race, gender, or social status. Each person with whom nurses interact possesses a unique set of biological, behavioral, socio-cultural, and spiritual characteristics. It is the responsibility of the professional nurse to understand and respect these characteristics and their role in the well-being of the individual. It is the right and responsibility of the individual, family, or group to make autonomous health care decisions and to collaborate with nurses and other health care professionals in their care. Nursing science and the evidence for nursing practice is derived from research that is both basic and applied. Professional nurses evaluate the evidence when considering care alternatives. They participate in the research process to advance nursing practice and nursing science. Nursing students are unique individuals with diverse backgrounds and life experiences which enrich the educational environment for all students. Nursing students require substantive backgrounds in the theory and practice of nursing as well as in related disciplines including the biological, social, behavioral, medical, pharmaceutical, and biomedical sciences. They also require guidance to achieve increasingly complex levels of socialization, critical thinking, written and oral expression, and research skill based on their educational level. Nursing students have the responsibility to actively participate in their learning. The university provides multiple support systems which students have the responsibility to access when needed. Faculty have the responsibility of structuring the teaching and learning environment to facilitate student learning, taking into consideration individual learning styles and personal professional goals. Year of first class: Initial cohort of bachelor’s students enrolled in 2007 and graduated in 2009. Start of nurse practitioner master’s program: UCI began educating nurse practitioners in 1996 in the Department of Family Medicine via a post-master’s degree certificate program. In 2004, the university began collaborating with California State University, Fullerton to provide family nurse practitioner coursework for their master’s students while continuing the post-master’s program. In 2009, UCI admitted its first master’s-level nurse practitioner students. Highlight: In 2011, nursing science received a $1.5 million federal grant to establish Orange County’s first nurse-managed clinic – the SOS-El Sol Wellness Center at the El Sol Science & Arts Academy in downtown Santa Ana.